Just one photo today! The beautiful threads from Lorraine at Colour Compliments are the perfect complement to the Caron Wildflower and DMC threads I already had. With them all together, I think I found my stitching mojo for the January CQJP 2015 block! This is the direction I want to go! 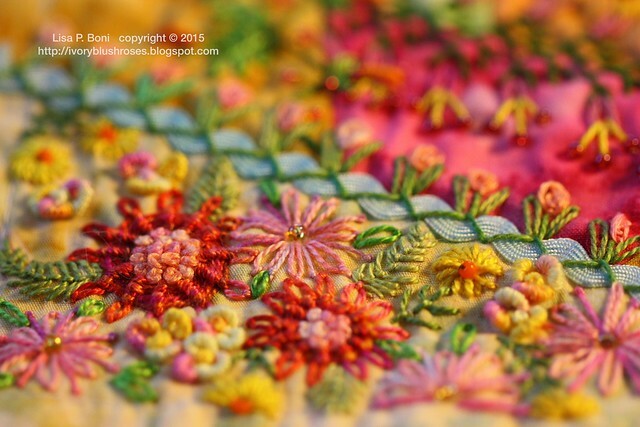 I want the block to become an embroidered tapestry with lots of interest, texture, and color. Up until now, I've been feeling pretty intimidated by the bright colors, but today they feel good! And a perfect antidote to the dreary grey day outside. Now if I can just keep it going for all twelve blocks. Lisa, your stitching is lovely! What a wonderful combination of color and texture. ooooh - this makes me think of summer!!! The colors are 'joyous' and as always your work exquisite.